A young couple starting a family in the city purchased this two story loft in Boston's South End. LOFT LIVING. 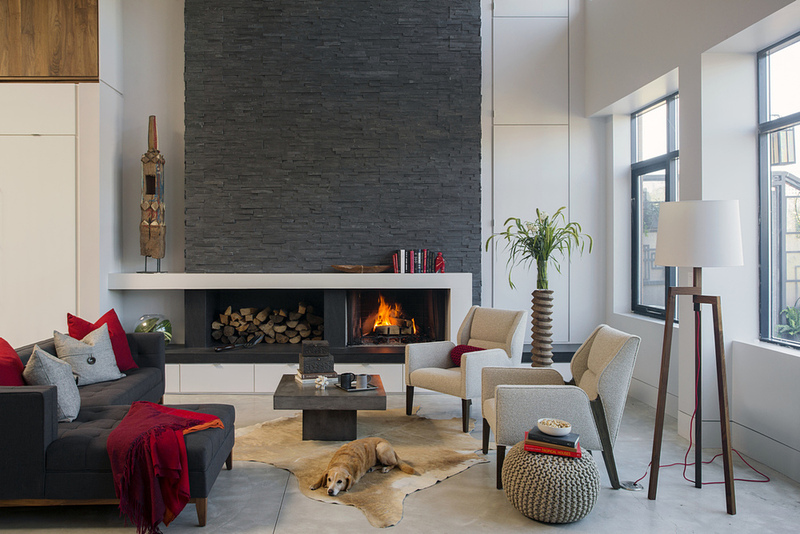 The goal for the open living space was to add texture, scale and utility. The kitchen was renovated with custom cabinetry and reconfigured for increased functionality, with more storage, larger prep surfaces, and new energy efficient appliances. White paneling wraps the abutting wall creating a neutral and textured surface. A walnut element wraps the wall and ceiling above the kitchen, adding much needed warmth, scale, and lighting to the living space with its twenty foot ceiling. 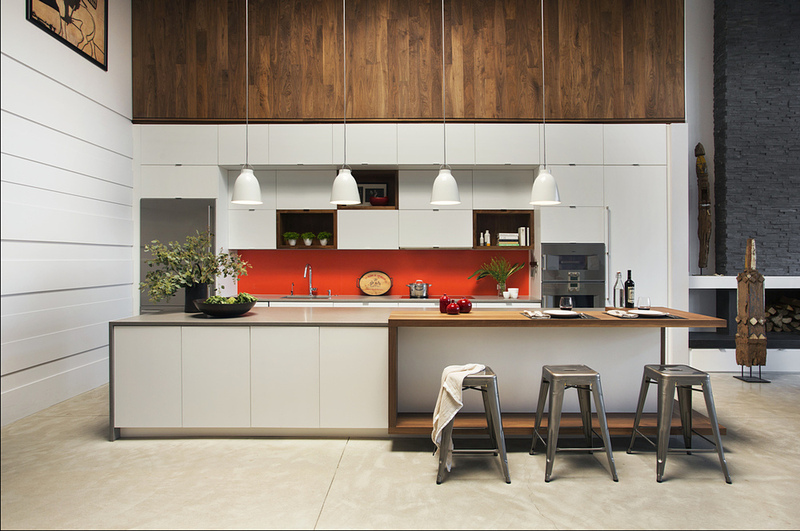 The use of walnut also weaves through the space in the upper cabinets and the raised seating area at the island. The fireplace area was re-envisioned for improved aesthetics, scale, and proportions. Former clutter-prone open shelves are now clean, functional cabinets, paired with a stone element, for added warmth and texture. MASTER REINVISIONED. New walnut stair treads lead up to the master suite. 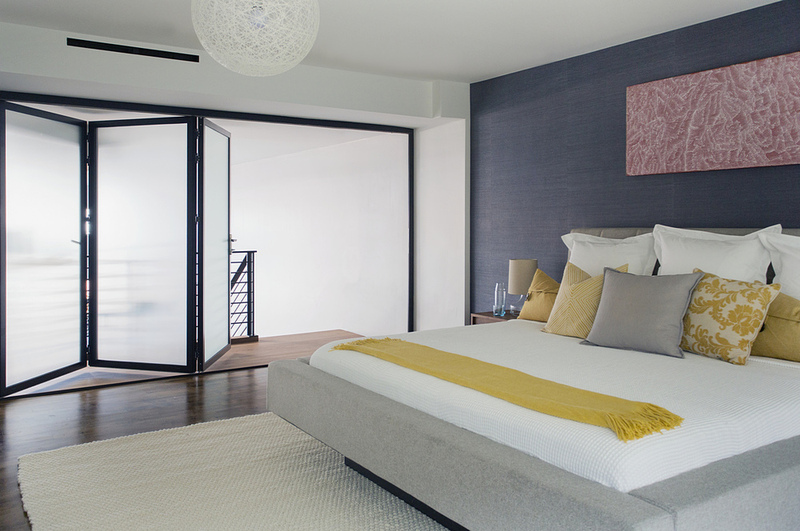 A wall separating the master bedroom from the double height living space was replaced with a folding glass door to open the bedroom to the living space while still allowing for both visual and acoustical privacy. Surfaces built into the new railing atop the stair create a functional work area with a fantastic view and clear shot to the play space below. 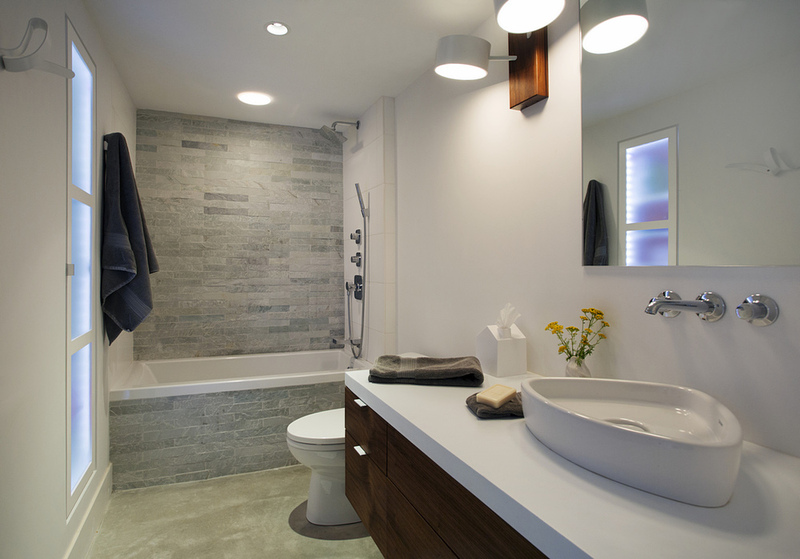 The reconfiguration of the master bathroom opened up the space by pairing a platform shower with a freestanding tub. The open shower, wall-hung vanity, and wall-hung water closet create continuous flooring and an expansive feeling. 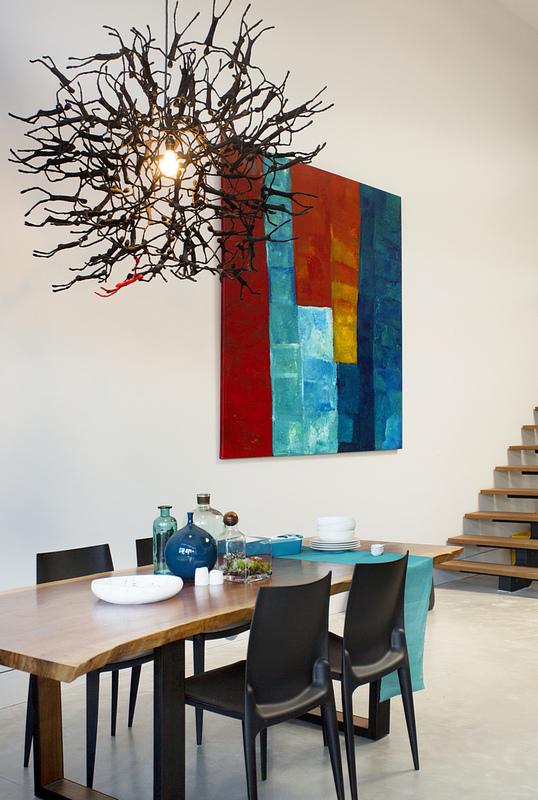 The result is a welcoming space with a calming aesthetic. BORROWED LIGHT. The addition of interior transom windows readily admits 'borrowed' daylight into previously dark interior spaces, including the nursery, entry, and guest bedroom. The entry area became an 'urban mudroom' with ample storage and a small clean workspace that can also serve as an additional sleeping area, while the nursery playfully incorporates framed interior windows to the living space. The dark hardwood floors on the mail level were removed and the concrete below was polished, creating a durable, low-maintenance finish that helps disperse light in the space. Collectively, the renovation of the loft creates a delightful improvement to the aesthetics, scale, and functionality for the growing family to enjoy.